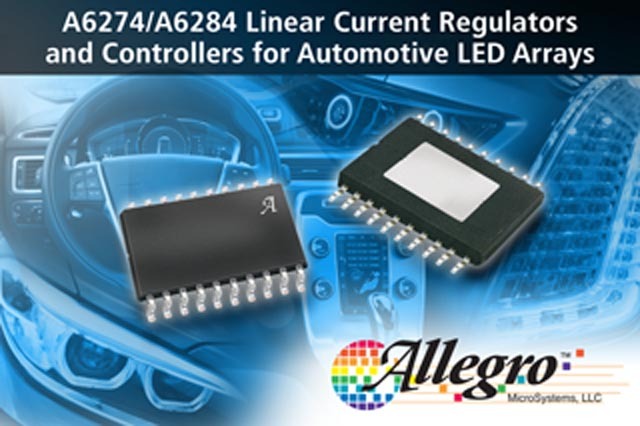 Allegro MicroSystems, LLC announces two new adjustable linear current regulators for driving automotive LED arrays. Allegro’s AEC-Q100 qualified A6274 and A6284 devices include many new features designed to further enhance the existing family of Linear LED drivers. These new low-EMI ICs integrate an optional pre-regulator gate drive to dynamically and linearly control an external P-channel MOSFET, which extends the output power capability of a linear LED driver by moving most of the power losses to an external power FET. This eliminates the need for a DC/DC Switching solution and its associated inductor, diode and higher EMI. The ICs sink up to 60 mA (A6274) or 120 mA (A6284) from each of six LED pins, and may also be paralleled to drive higher current LED strings for a total of up to 720 mA. Furthermore multiple ICs can be configured in parallel for large lighting systems. LED light output can be adjusted by PWM dimming, and the ICs provide an internal PWM dimming circuit that is programmed by external resistors for accurately controlled PWM duty cycle and frequency. This eliminates the requirement for a PWM signal usually provided by a local microcontroller or 555 timer. Alternatively, an external PWM signal can be applied in particular if already available by an existing Control Module. The devices can be configured to change between Full and Dim modes for bi-level operation, as often needed for stop/tail Rear Combination Lamps (RCL) or Daytime Running Lights (DRL). Both “latching” and “unlatched” versions are offered, to align fault detection and protection schemes with global standards for automotive external lighting applications. Both devices are supplied in a 20-lead, eTSSOP package (suffix “LP”) with exposed pad for enhanced thermal performance.